Sell your Mac to Gazelle. It takes just a few minutes to sell your Mac. What to do with your old Mac? Why not recycle it and give it another life? Maybe it's time you learned about Gazelle's Mac recycle program. We will buy your Mac and recycle it for you, increasing the size of your wallet while reducing pollution. "How easy is it," you ask, "for me to sell my Mac"? Incredibly easy, and fast like a Gazelle. We'll ask a few questions to help us assess the condition and value of your Mac. Then we'll make an offer. Soon as you accept it, we'll send you a pre-paid box to ship it back to us. 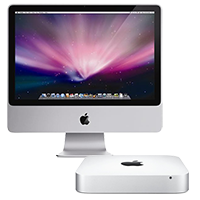 Once we receive your Mac, our inspectors will look it over to confirm the original offer. If we have to revise it, we'll send you an email with a new offer. If you choose not to accept it, we'll send your Mac back to you free of charge. In other words, there is zero risk on your part, which is why Gazelle is the smart choice for your Mac trade-in. It's why more than a million customers have trusted Gazelle to recycle their used devices. How do we pay you? We give you three options for collecting your payout. We'll mail you a check, deposit your money in a PayPal account, or send you an Amazon gift card. It's your choice. There is some serious money to be made if you play your cards right. But for many Mac owners, it's not just the money. They also tend to care about the environment, which is another reason our Mac recycle program is so popular. Remember, once you accept our offer, you have 30 days to send your Mac back to us, then your Mac buy back offer expires. You'll have to start the process all over again, and get a new offer if you miss the deadline. So don't delay - get started now and sell your Mac at Gazelle.